Solid surface worktops are a firm favourite amongst UK homeowners. They are the simple way to add an element of luxury into any kitchen design, measuring up as the more affordable alternative to solid natural stone worktops like quartz or marble. Completely customisable to any design, solid surface materials are a hugely flexible design choice, making them a valuable resource to kitchen retailers too. 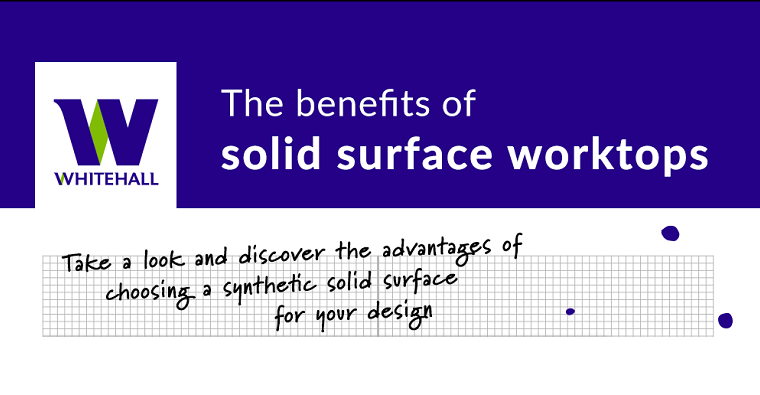 Aside from their convenience, solid surface worktops also have a number of benefits in their own right. From their durability to seamless finishing, there’s a lot that can be achieved with materials such as Corian, Hi-MACS, Hanex and Staron. Stain and resistant: Solid surface worktops are impermeable – they are resistant to even the toughest stains including grease, wine, makeup and permanent marker pens. Extremely durable: Built from a blend of acrylic, epoxide or polyester resin, the synthetic properties of solid surface worktops make them extremely difficult to scratch, crack or damage. With a lifespan of over 10 years, a solid surface worktop usually outlives the rest of the kitchen. Renewable and repairable: Chips, scratches or scorches can be removed with light sanding – renewing the surface appearance back to its former glory. Bacteria and mould resistant: Impermeable solid surface will not support the growth of bacteria – this makes them extremely hygienic, easy to clean and resistant to mildew. The bacteria-resistant properties of solid surface worktops make them the preferred choice for medical and laboratory settings. Thermoformable: Solid surface materials can be heated, bent and set into any shape to create beautiful bends and corners. Seamless joins: Joins are glued and sanded until they are almost invisible to the naked eye. This creates seamless elegance within any design. To create unique patterns or replicate the textures of stone. Easy to clean and maintain: Solid surfaces are incredibly low-maintenance – their impermeability makes them very easy to keep clean and shiny. Solid surface worktop = No sealing, painting, grouting or varnishing. Would you like to tap into the benefits of solid surface materials for your next project? Or perhaps you have a repair you’d like to discuss? Get in touch today via email on info@whitehall-uk.com or call 0113 222 3000.